iOSEmus, the latest app installer is available on the market which let you download your favorite Cydia tweaks, apps, and games. As there is no stable jailbreak available for the current version of iOS, many jailbreak lovers are missing your favorite Cydia tweaks, apps and games, now you can use it as Cydia alternative on your iOS device. iOSEmus [ About ] works on jailbroken device even if you are having the older version of iOS with jailbreak then also you can install it on your device. It doesn’t require your Apple ID, therefore you don’t need to worry about your safety and warranty. Once you have downloaded iOSEmus on your device, it is very easy to use still there is some probability get some difficulties. Here below we are showing you how to overcome those difficulties. 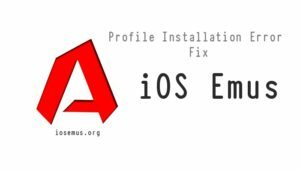 Basically, it is very easy to install iOSEmus on your device but sometimes due to misfortune on heavy traffic volume on the server, you may get the Profile Installation Failed Error. Two common types of error you can find though both the errors can be fixed following few easy steps. First one, if not working try after sometimes, hope the error would be fixed then if the error still persists then you need to clear your device cache. Here we are showing you how to do it. Follow the steps below to clear your device cache. Put on Airplane mode on your device. Go to the Settings app and tap on Safari. You will get Clear History and Website Data. Turn off your device Airplane mode, wait for few minutes. Try the Installation process from the beginning. Once the errors are fixed, you can install iOSEmus on your device without any error, but don’t expect the same functionality as Cydia. Now the iOSEmus Profile Installation Failed Error is fixed, hope you have enjoyed the iOSEmus on your device. Comments below to let us know your experience and follow us on Facebook to get more relevant updates.